If you love IBM Domino – please learn Java, NOW! It’s now over 3 years ago that I head to take over a project, which covers a critical business case. And it was one of my most painful experience ever. It ends up that each day I worked on that project, I took pain-killer. The request was quite simple: “Please rollback a Java agent to a LotusScript Agent”. But I’ve never seen such a painful implementation of Java. It was quite horrible and against all that I’ve learned about Java. “How do I bring that in my Domino / Notes Projects?” – This is one of the most critical part. But in fact it’s very easy. DECIDE and DO…. And when you feel your self fit with Java, it’s time for the best-selling developer book form IBM Press called Mastering XPages. Let us begin with building the kernel for the document processing. This kernel is also a part, which we have used as proof of concept. In the previous post (https://guedebyte.wordpress.com/2012/09/07/documents-and-spreadsheets-i/) our focus was on the idea. This entry is about the main processing. The first step is, create a “lib” directory in your project and add the apache-poi libraries to this directory. 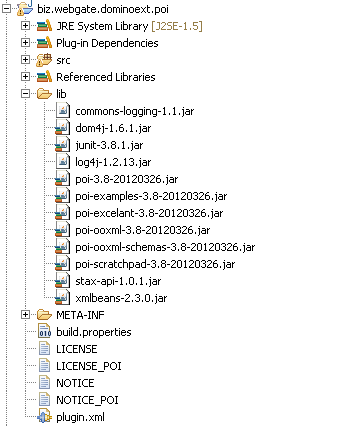 Add the libraries to the build-path (without the commons-log and log4j), by selecting the libraries: Left click and select “Build-Path/add to build-path”. Commons-log and log4j are not needed because the extensible API delivers his own implementation of log4j. If you need a dedicated version of those libraries, it is recommended to encapsulate the code in a separate plugin, which exports only the functionality to the plugin, which extends the api. Both plugins have to be in the same feature (we will come back to this later). We can now build an interface, witch represents the bookmarks. Now let’s build the kernel. We do a simple 3 step approach. // First Prozessing all paragraphs. That’s all you need for the kernel. The full class will be available with the source code later this year. The next step is to build the UI for the domino designer. Watch out for the next episode. It’s very easy to extract all properties. An object can also be accessed with json.getJsonObject(“name”) . But no arrays. There is no getter. //-> here do all the funny stuff with the jsDate object. Thanks to Philippe Riand (IBM) for sharing your code. Its so inspiring to read your code. In several projects we are faced with the request to export data to a spreadsheet (mostly excel) or build a document for ms-word. So our development team requested the following: “Build an extension that helps us generate word documents or export datasets to spreadsheets”. After some research, I found a project called Apache POI. 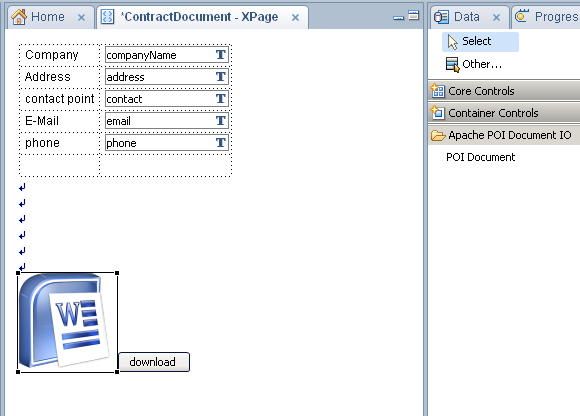 Apache POI covers all the stories, which we try to implement. 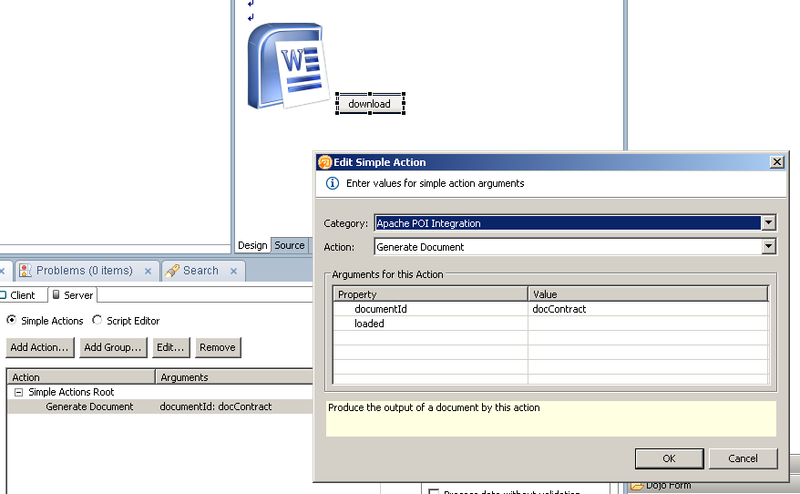 So let’s begin with the first story: “Generating a new ms-word document”. 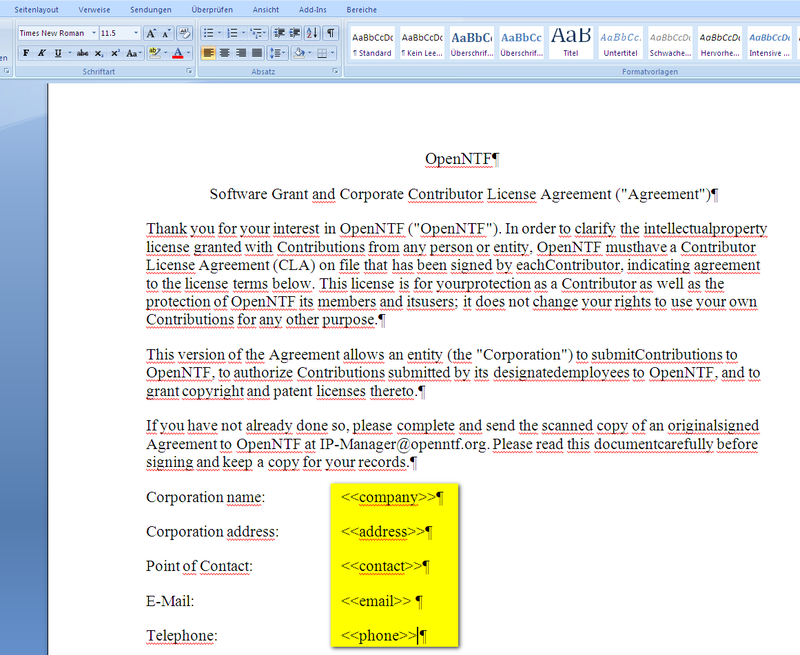 We define where the modified OpenNTF Licence Agreement is. 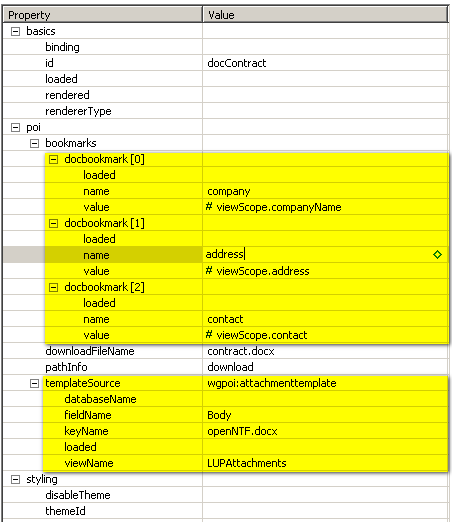 This could be a file resource in the application, or a document accessible via view and a predefined key. As you see on the word document, we have defined several “<<NAME OF BOOKMARK>>” tags in the text. This text must be in the same style, so they are in the same “run” Element on the document. In our “POI Document” – Control could we now define a bookmark for each <<…>> element, which contains the name and a value. The user can now fill in their values on the page and generate a customized word document. Developers are able to build in applications to produce customized documents in a very short time. In the next blog entries, we will show you how we have build an extension of this function. In der modernen Software Architektur ist das Schichtenmodell (N-Tier) Standard und weit verbreitet. Die Vorteile liegen auf der Hand, da die Trennung von Präsentation, Logik und Datenhaltung auch eine horizontale Entwicklung begünstigt. Die traditionelle Lotus Notes / Domino Entwicklung hat die Trennung von Präsentation, Logik und Datenhaltung bis jetzt nicht gefördert. Durch das Fast-Prototyping wurden sogar bewusst die Schichten übersprungen und die vertikale Entwicklung, sowie knappe Budgets haben eine saubere Trennung der Schichten stark behindert. Die logische Konsequenz war, dass Domino den Ruf bekam, nicht modern zu sein, keine N-Tier Struktur zu unterstützen. Automatisch wurde somit Domino von Architekten, die N-Tier als Muss-Anforderung definierten, gestrichen. Und dies zu Unrecht. Ich habe während meiner Programmiererzeit schon viele Anwendungen gesehen, die keine N-Tier Struktur besassen, aber auf Plattformen liefen, die als N-Tier Plattformen galten. Genau so habe ich einige Domino Anwendungen gesehen, die das N-Tier Architektur Prinzip passgenau umgesetzt hatten. Mit dem neuen Relese 8.5.3 geht aber IBM konsequent den Schritt weiter, um diesen Missstand zu bekämpfen. XPages impliziert eigentlich eine N-Tier Struktur. Es ist jetzt nicht nur möglich Applikationen nach den N-Tier Architektur Prinzipien auf zu bauen, nein es ist sogar gewünscht.